Sea Fortress Suomenlinna and The Esplanadi Park will appeal to history buffs. 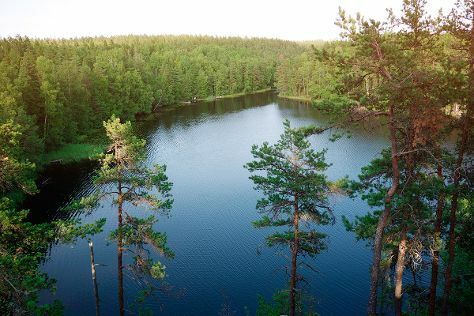 Get outdoors at Nuuksio National Park and Sipoonkorven Kansallispuisto. Step out of Helsinki to go to Pernio and see Teijo national park, which is approximately 1h 50 min away. Next up on the itinerary: contemplate in the serene atmosphere at Rock Church, take a stroll through Katajanokka, pause for some serene contemplation at Helsinki Cathedral, and hike along Pornaistenniemi Nature Trail. For other places to visit, traveler tips, and more tourist information, you can read our Helsinki trip builder app . If you are flying in from Switzerland, the closest major airport is Helsinki Vantaa Airport. In May, plan for daily highs up to 18°C, and evening lows to 7°C. Cap off your sightseeing on the 16th (Thu) early enough to travel back home.